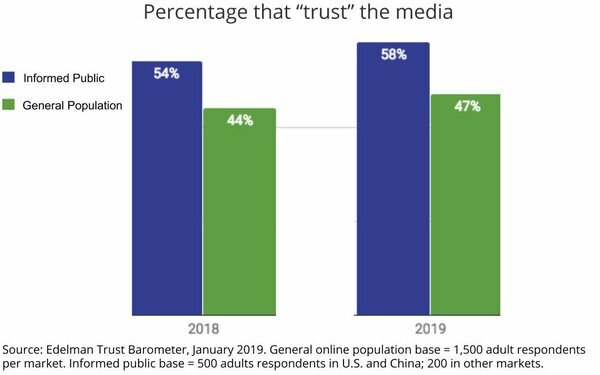 Trust in media has improved both for the "informed public" as well as the "general population," according to the 2019 edition of the Edelman Trust Barometer. However, the gap between the informed and uninformed public has increased to an 11-percentage-point difference from just 10 points in 2018. The findings are a global perspective based on surveys conducted by Edelman worldwide between October 19 and November 16, 2018. In the U.S., trust in media improved for both groups, but dramatically more so for the “informed public,” where the percentage of trust in the media grew 15 points to 60%. Trust in the media among the general U.S. population expanded only six points to 49%.